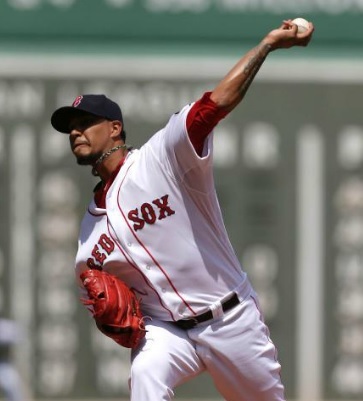 Felix Doubront shut out Arizona over seven strong innings as the Red Sox beat Arizona 4-0 at Fenway Park to take the series two games to one. For Doubront (pictured) it was his 15th straight start of three or fewer earned runs allowed and nineteenth in his last twenty starts. He allowed just five hits, struck out five and did not walk a batter. The Red Sox jumped out to a 2-0 lead in the bottom of the fifth inning on a sacrifice fly by Jacoby Ellsbury and an RBI single by Dustin Pedroia. Boston doubled the lead an inning later on RBI singles by Ellsbury and Shane Victorino.